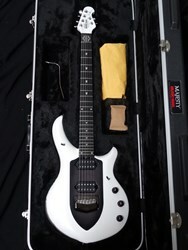 Here is a new Majesty i got new and straight from a Music Man dealer. The Glacial Frost finish is very nice it's kind of a pearl white and not glossy more a kind of satin. Looks very cool in person, hard to photograph. 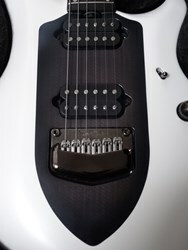 Featuring laser-etched maple that's finished to resemble carbon fiber, the Majesty guitar boasts a super-lightweight body with unparalleled fret access, DiMarzio voicing and an ebony fretboard with the Majesty logo (for Dream Theater's original moniker) above the first fret. 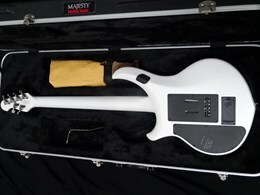 Music Man's Majesty guitar was a hot topic leading up to the 2014 NAMM Show. 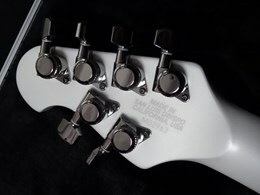 The Majesty comes with Music Man's Game Changer technology, which is used to enhance the switching speed of the 3-way and the piezo to HH switch. True to form, the audio signal is never digitized or modeled in any way, providing a transparent analog signal path for the absolute purist. 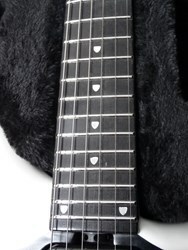 "The Majesty guitar symbolizes the very reason why I am so proud to be a Music Man artist. I had the idea for this guitar a couple of years ago but it is because of their innovative spirit and dedication to the art of guitar building that it is now a reality. I wanted to push the boundaries of sound, feel, design, ergonomics and esthetics and from day one Sterling and the Music Man engineering team were completely on board and committed to the project. It's all about asking the right questions; 'How can we make this guitar sound and look better, feel lighter and easier to play?' 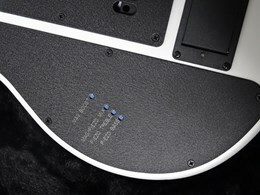 'How can we make access to the upper frets even easier, make the guitar an even more versatile creative tool while designing a modern, sleek and beautifully crafted musical instrument. Those questions were pondered and answered by head engineer on the project, Drew Montell and tested, tried and questioned again and again by myself Sterling and Dudley over the past 2+ years. 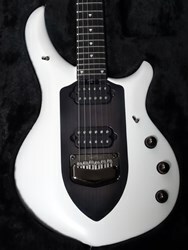 Things that we learned and loved about my previous JP signature models were carried over such as the fast neck contour, fretboard radius and stainless steel frets while new additions such as the Game Changer circuit were added to make the Majesty even more incredible. 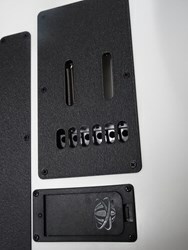 The preamp and volume boost from the JP13 that I absolutely love was also kept onboard along with my signature DiMarzio 'Illuminator' pickups while a complete change to the body design and the incredibly creative "Maple-Carbon-Fiber" laser etched top was added as a really slick aesthetic touch. 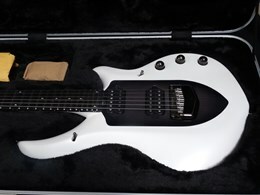 Lastly, the mirrored 1st fret Dream Theater 'Majesty' logo and beautiful pearlescent frozen paint make the guitar look like its ready to be wielded on the battlefield. Truth is, I can't put the Majesty down! I am so grateful that I am able to collaborate with the best guitar company on the planet and so incredibly proud that together we have created what is to me, the perfect musical instrument for guitar players. I really hope you get a chance to play one and am confident that you will feel the same!"